Paper (make sure it is square). Get a square piece of paper or trim a piece of paper so that it is square. Fold your square in half diagonally (have a look at the picture below). 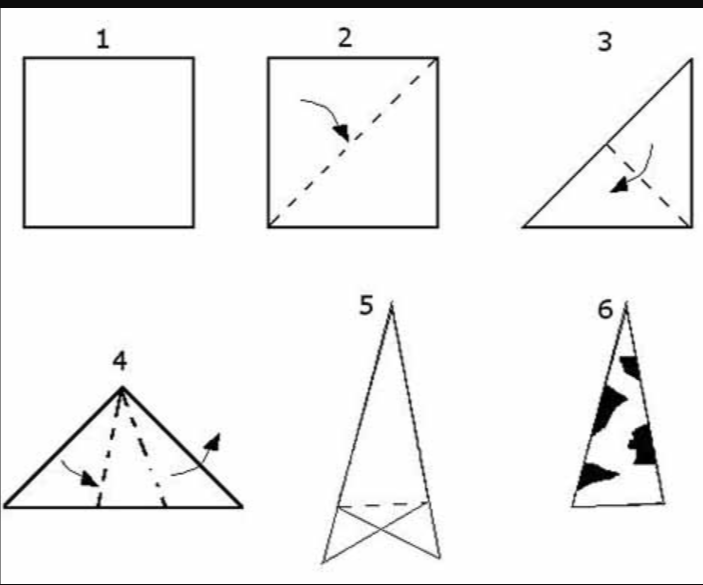 Fold your triangle in half – again diagonally (look at the picture below). Fold paper in thirds … one side to the front, the other to the back. Trim the extra piece of paper off the end of your small triangle. Around the outside of your triangle, cut some fun designs — circles, squares, triangles, squiggles … anything goes. Unfold your paper and look at your masterpiece.